Forna glue down cork tiles will require the correct adhesive, Wakol D3540 Cork Adhesive to be used as the bonding agent between the subfloor and our cork floor. (3M 30NF Green Fastbond Contact Adhesive can be used as an alternative but may not bring as good results. Be sure to acquire enough adhesive to cover the square footage of intended space. Our glue down floors also require 2 coats of water-based polyurethane (Loba 2K Supra AT) after installation to seal and protect. Failure to adhere to these requirements can void warranty. When it comes to LONG lasting adhesive and cork, you need to work with a water-based contact cement. We sell Wakol D3540 Cork adhesive. It will lay 170–180 square feet of cork flooring/wall tiles. 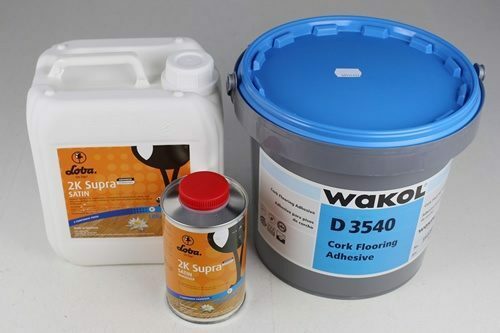 If you cannot source the Wakol D3540 cork adhesive locally, then the next best thing is to purchase from iCork FLoor. The other option with the BEST GRAB is: 3M 30NF Green Fastbond Contact Cement adhesive. Germany’s Loba 2K Supra AT floor finish is only finish that can compliment the elasticity of cork. Glue down cork tiles are extremely flexible which means they require a finish that will move and flex in the same manner. Forna has investigated and experimented with several finishes over the years and deemed the Loba finish as the one that works best with our cork floors. We have also tried other formulations – without much success. If you want the best results then take our recommendations to heart. When installing cork on walls, we still recommend they receive 1-2 coats of Loba 2K Supra AT polyurethane to seal the seams and prevent shrinkage. Like all wood products, cork can shrink. By applying the 1-2 coats after the tiles are installed, the shrinkage is mitigated to “zero” or none.